Dr Robert Cecil Robertson (fl 1920-1930's) was the husband of Eleanor Moore Roberston, artist. After marriage they moved to Shanghai where he worked. He was a painter of landscapes and exhibited at The Scottish Academy and the Glasgow Institute (1932-1940). 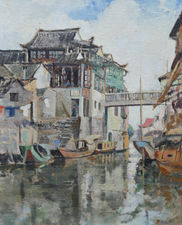 He painted Far East landscapes around Hong Kong and China whilst abroad.